First prize for single craft piece of the Madrid Community Region and Grupo Hera’s Barcelona’s Residu’art’s third edition, has been a runner-up on 2009’s Caja España’s Sculpture Award and honorable mention on the Alicante’s Concurso de Hogueras Experimentales’ tenth and eleventh editions. 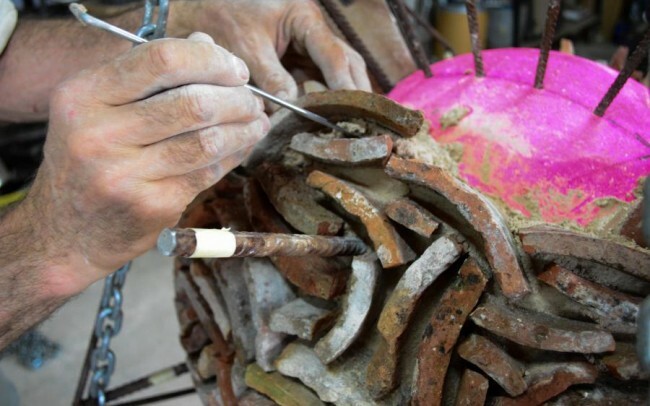 After having participated in Barcelona’s Drap-Art International Festival of Creation and Recycling’s first and second editions, his work has been chosen in different occasions by this Organisation for its annual exhibition and has also attended as guest artist to different national and international events such as Gijón’s first Festival of Creation and Recycling, the tenth edition of Maçart (L’Ampurda’s Festival of Contemporanean Culture and Recycling) the fourteenth edition of Festambiente (Grosetto’s Festival of Ecology and Solidarity, Italy) or to the second Cetinje’s Contemporanean Arts Biennial, Montenegro (former Yugoslavia) among others. He has also participated in numerous collective exhibitions. His Millan Chair was chosen among other pieces proceeding from different Spanish Autonomous Communities, to represent Spanish avant-garde craft in an itinerant exhibition that was shown in the branches of the Instituto Cervantes in Port, Paris, Rabat, Casablanca, Cairo and Delhi. And the installation “The Financial Market” was part of another exhibition shown in Tokio and Art Beijing in China. He was recently invited to participate in Pittsburgh’s Re-New Festival in the US where he’d presented four of his latest works. Since a few years ago he’s dedicated part of his time to teaching on an ongoing basis at Drym School where he gives workshops for children and keeps a drop-in course on sculpture and design permanently open for adults. Also he has given workshops, talks and masterclasses as the one at Altair School in Madrid or Francisco De Vitoria University in Pozuelo de Alarcón, Madrid and at the Re-New Festival in Pittsburgh, US. © Copyright Alberto Carvajal 2019. Derechos reservados.